Tonight, this apology comes in the form of brussels sprouts. I know so many people think they absolutely despise these baby cabbages, but when they’re cooked properly (not boiled like your grandma makes them) they’re unbelievably delicious. I’ve noticed they’re weirdly trendy, almost like the mom jean of side dishes, and are on practically every DC restaurant menu. 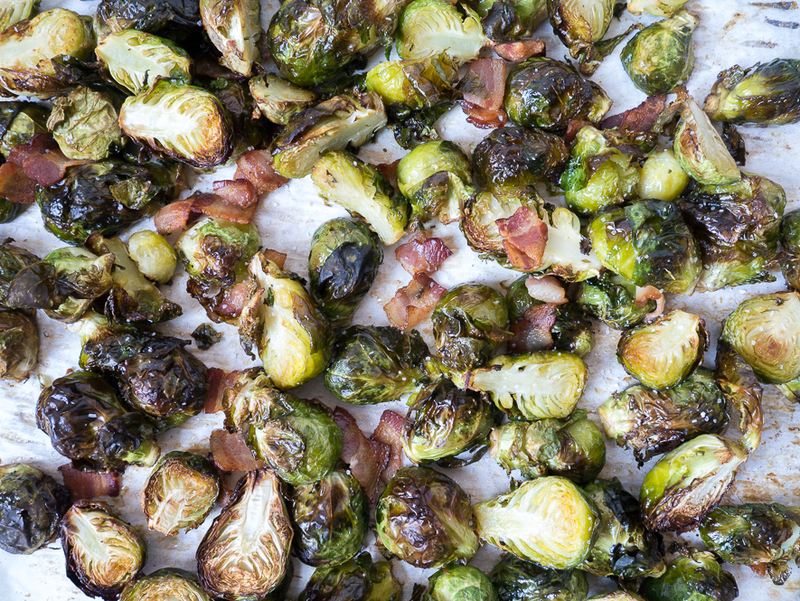 My favorite way to eat them is to roast them with bacon so they caramelize in the smoky fat, and the leaves get shatteringly crisp. Then they’re drizzled with a little balsamic vinegar to cut through the richness, and finally topped with pomegranate seeds for a festive pop of color. 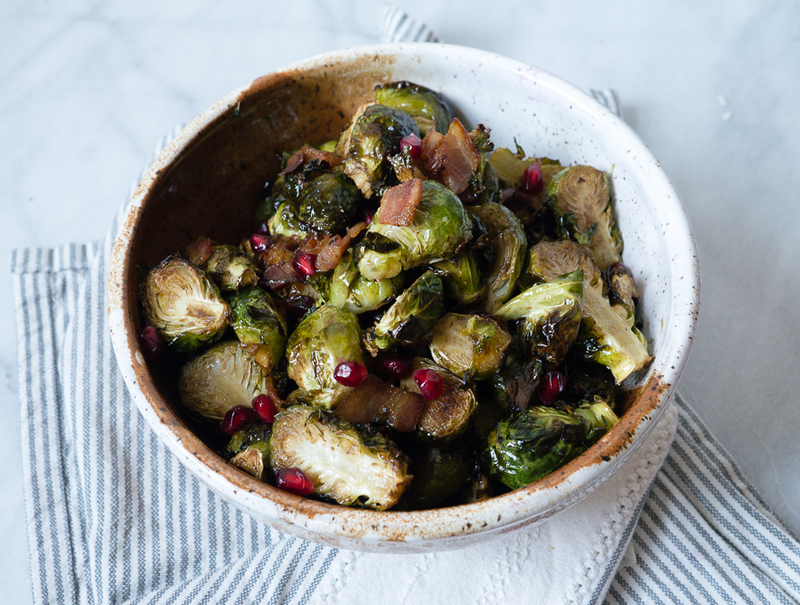 Being healthy has never tasted so good, and if you have an upcoming holiday party or christmas dinner, this would be the perfect side to make! Besides the fact that they’re so good, they’re also crazy easy to make and only take 3 main ingredients and 40 minutes. They would be great served with a roast chicken, as part of a warm grain salad for lunch, or just straight from the bowl (you can guess which option I picked). 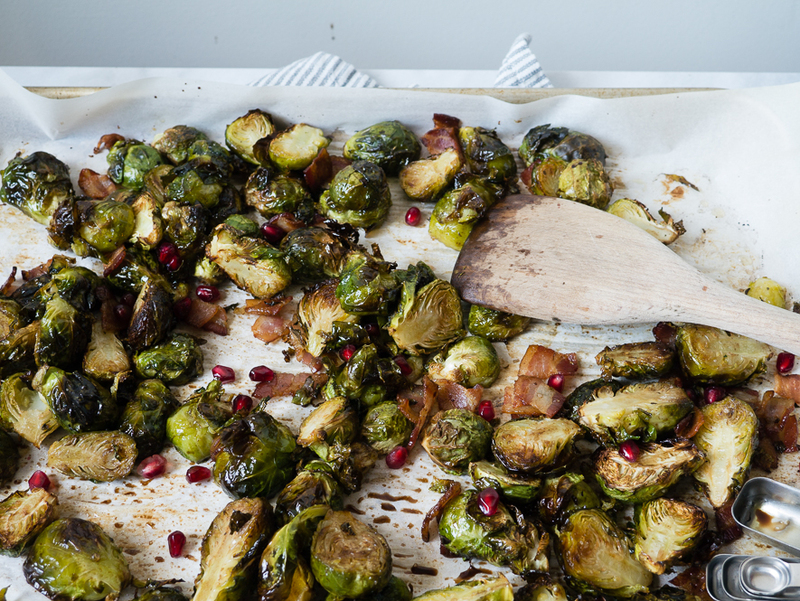 Start out by cutting brussels sprouts in half, and slice bacon into strips. Roast, stirring every 10 minutes, until everything is crisp and golden. 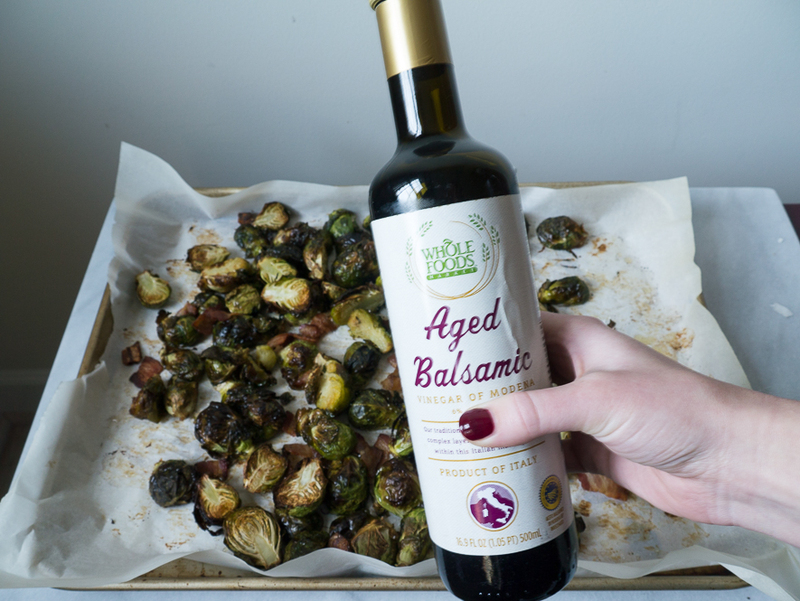 I found this really good balsamic at Whole Foods for just $5, so major cheers for the Amazon acquisition. A quick drizzle brightens things up, and then we sprinkle the pan with fresh pomegranate seeds. If you’re feeling lazy, Trader Joe’s has the pomegranate seeds already packaged and ready to eat, or you can buy the fruit whole and do it yourself while the veggies are roasting. 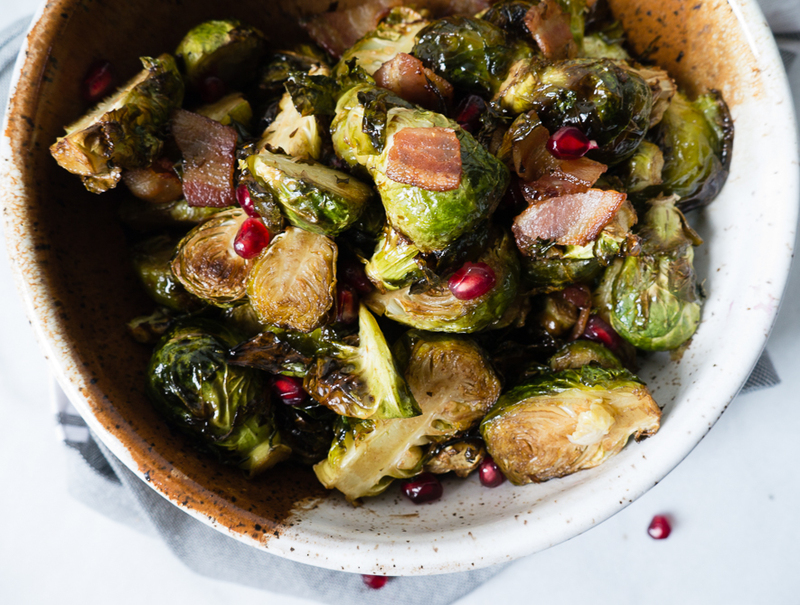 Preheat oven to 400 and while oven is preheating cut brussels sprouts in half through the core and slice bacon into small strips. 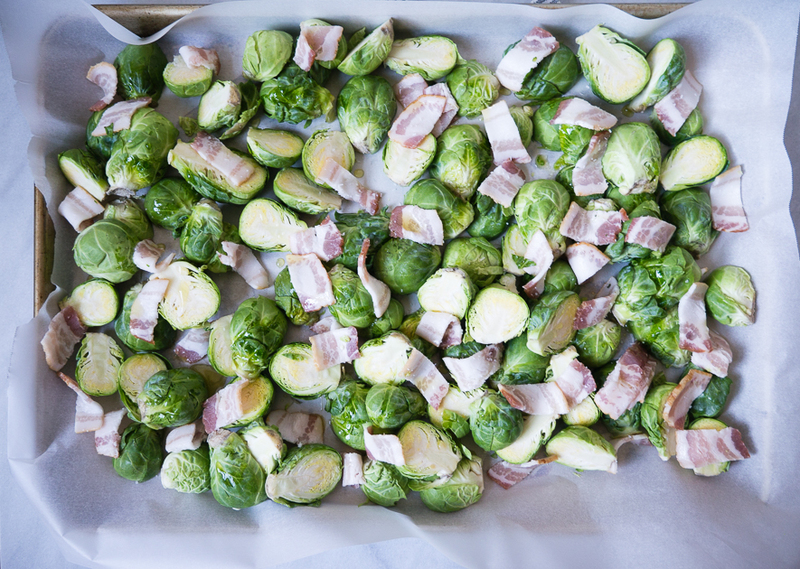 Line a baking sheet with parchment or foil, and spread the brussels and bacon out evenly. Drizzle with olive oil and sprinkle with salt and pepper. Stir so everything is coated in the olive oil and place in the preheated oven. Roast for 30-40 minutes, stirring every 10 minutes, until brussels are browned and tender and bacon is crisp. Remove from the oven, and drizzle with balsamic. 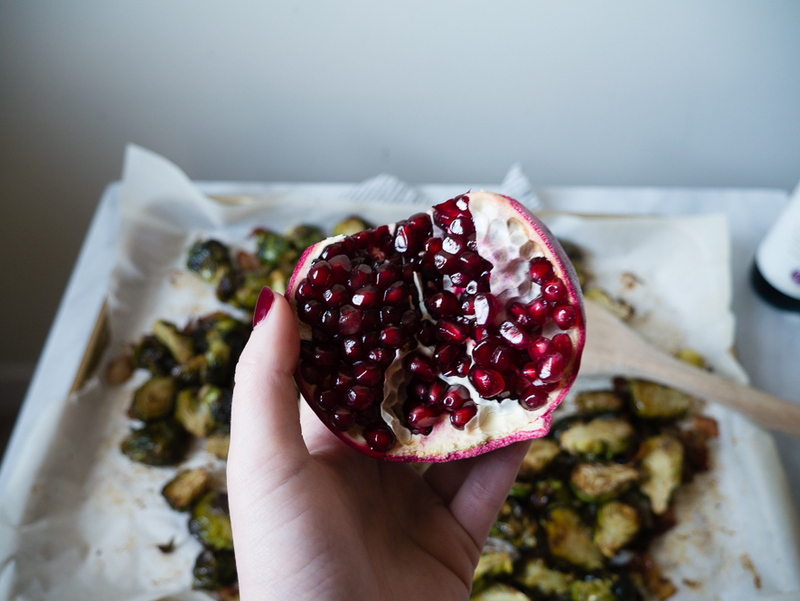 Transfer to a serving bowl, sprinkle with pomegranate seeds, and serve hot.